Well, our weekend didn’t exactly go as planned, but I’m choosing to look on the bright side and be thankful that our house is still standing and we are all okay. We had some awful, awful weather this weekend and we spent the better part of it watching the local weather and worrying about what might possibly be heading our way. Or at least I did, anyway. Brian isn’t a worrier so he didn’t seem to be as bothered as I was. Ha! Friday night started out normal as always. 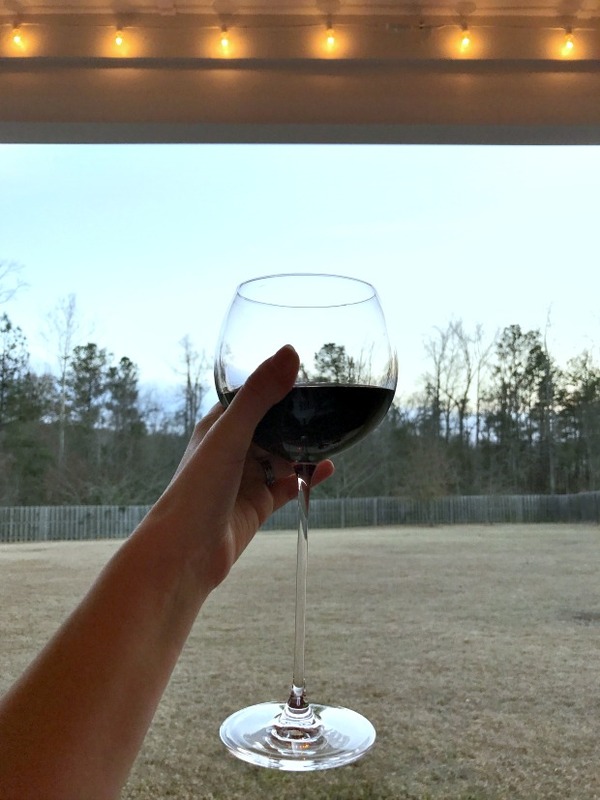 The kids played on the back porch and I enjoyed a glass of wine while we waited for B to bring home Carrabba’s. We spent the evening eating yummy food and catching up on shows. B and I watched the second episode of The OA and I hate to admit it, but I’m hooked. I don’t love watching weird stuff because it gives me the creeps, but I just can’t stop watching this show. It is really good. Saturday morning we were greeted by both kids in the bed due to the storms in our area so we were up extra early. We had loads and loads of laundry to do and we also had a project to work on for J, so it wasn’t such a bad thing getting up early. Well, about halfway through the morning just as we were about to start on Jacob’s project, a massive storm blew up practically out of nowhere. Almost simultaneously the tornado sirens started going off, so we snatched up the kids and ran downstairs into the closet under our stairs. B turned on the news and they had broken into the regular coverage to inform us that there was a tornado in our area. As a matter of fact, it was just five or so miles up the street from us. Bad weather used to not bother me when I was younger, but now that I know I have two little lives to take care of I hate it. I hate it, y’all. It completely freaks me out so I was a total wreck. It poured and was crazy windy for about a half an hour and the power flickered a few times, but then it just left as quickly as it had come. We were able to come right back out of the closet and work on Jacob’s project for school. Their 100th day of school is today, so we had to make a shirt with 100 things on it. We decided on Legos since he’s so obsessed with them right now, and the shirt turned out great. Now whether or not he will actually keep it on all day remains to be seen. The rest of the afternoon was spent cleaning, laundry-ing, and working on some Valentine’s Day decorating. I started on my chalkboard, and I can’t wait to share it with all of you as soon as it’s done! As the day continued the skies cleared and the sun came out, but the weather team had warned us that more severe weather would be coming through later Saturday night. We decided to go ahead and go to church to get out of the house, and then after church we went to our favorite BBQ place for dinner for my uncle’s 70th birthday. At this restaurant they put paper down on the tables and they have buckets of crayons on the tables, so I drew Elsa to keep Olivia entertained while we waited for our food. (Not too shabby, huh?) There were about 35 people so the dinner was long, and by the time we got home it was late. We had just enough time to get the kids down and watch a couple of shows and then we flipped over to the news where they were warning everybody that the weather was going to be very bad again. They said that on a scale of 1-10 our chances of having bad tornadoes was a 6 and our chances of having damaging winds of up to 70 mph was an 8. Sigh. So B and I hopped up and prepared our “storm shelter” and then fell into bed around 11:30. They had said that the worst of the weather was due to occur between midnight and 2, so I knew that it was getting close, so I couldn’t sleep. I tossed and turned, and kept my ears finely tuned for any freight train noises. Fortunately the worst of it went around us and the sirens never went off to indicate any tornadoes, but we had another really bad storm around 4 AM. Olivia was so terrified when the thunder woke her that she started crying and her breathing sounded so scary that I flew out of the bed and into her room as fast as I could to comfort her. She had gotten so upset that I think she was hyperventilating which explained the scary breathing. I knew she would never go back to sleep in her own room during the storm, so I brought her back into our bed where she fell asleep immediately. The storm was still raging, so I laid there for what seemed like forever, just waiting for the tornado sirens to go off, but thankfully they never did, and I somehow finally drifted off to sleep. B never has any trouble sleeping, so he let me sleep in Sunday morning since I hadn’t slept all night. I woke up around 8:45 feeling surprisingly refreshed, and I was extremely thankful that the house was still standing. We spent the morning finishing up laundry, cleaning, and finishing decorating the house for Valentine’s Day. We knew that even more bad weather was imminent Sunday afternoon, so we stepped out of the house long enough to have lunch at Chipotle, let the kids burn off some steam at Barnes and Noble, and grab Blizzards at DQ. Then we headed back home to hunker down for the afternoon. Guys, we were so fortunate. So fortunate. The line of storms Sunday afternoon seemed to split and go on either side of us. All we had was some heavy rain and wind for a few minutes and the power flickered a few times, and then it was done. We were able to venture out again Sunday evening for our usual dinner with my parents where we celebrated another one of my uncle’s birthdays. For the first time all weekend, I felt like I could finally breathe because I knew that all of the bad weather was finally behind us. It was a good evening indeed. Three rounds of tornadic weather, y’all. Three rounds. I’m so thankful that we made it through unscathed. We haven’t heard about all of the damage just yet, but I know one of the high schools nearby experienced a lot of damage, and one of the neighborhoods a few miles from us sustained a lot of damage. One of my friends actually lives there, but fortunately her house was spared. I’m starting this week with a grateful heart, even more so than I usually do. I’m just so so thankful that we were among the lucky ones to avoid all of the badness. Now, can we please have a weekend redo? oh my gosh, Lindsay! So glad y'all are ok and nothing was damaged. How scary that must have been!! Jacob's lego shirt is so cute and that Elsa....that's amazing! I can't wait to see your chalkboard!! Thank you! Yes, I'm a big baby when it comes to bad weather now, so it was not the greatest weekend. I'm just thankful everything turned out OK.
And thank you! I should be sharing the chalkboard next week sometime! I'm with you on bad storms and it always seems like we get them when I'm here alone with the kids and Drew's at work. Drew is great about having the news on his computer, so he can monitor things from where he is to keep as safe in a way he can. Scary! Jacob's shirt is cute! Tornados are definitely scary!!! We just had a ton of rain here, but I know it south Alabama and in your area, tornados went through. My husband's cousins in Roanoke had tornado damage on their property, and luckily they were okay. I think the older you get, the wiser you get when it comes to weather and the dangers it poses! So glad you guys are ok!!! I definitely get more scared now, too. I think I just realize the type of damage they can do! Sounds like you guys still were able to enjoy the weekend. Love Jacob's shirt - that is super cute! What a fun idea - pretty sure we never celebrated the 100th day of school! Jacob's shirt turned out so cute! Glad you guys are okay! Storms are such a wild thing. So scary!! Glad y'all are ok. I hate bad weather too! What is the OA? I obviously am not in the know!! Oh my goodness that weather sounds scary. I hate bad weather (and blame it on the fact when I was in first grade a tornado touched down 2-3 miles from our school. We were all in the hall with our heads down for so long. They were playing books on tape to keep things calm). I'm glad you all stayed safe. Oh my gosh, that is so scary, Danielle! I had a similar experience when I was in second grade. We had tornadoes all day long one day and we had to huddle in the hallway nonstop one day. It was awful. I'm so glad you guys are OK! That sounds so scary! I HATE bad weather too, especially now that I have littles to worry about. I love the lego shirt!! OMG I have now words for you! This California girl is TERRIFIED for spring this year, because #tornadoseason in Alabama. However, I give you major props for getting out there and doing things in between - Chipotle and Blizzards? That has to help :) Also, loving the Valentines decorations!! How scary! I would not have slept either. I do not live where there are tornadoes, so I can only imagine how scary they are. I am glad you were all okay. Thank you, Jenna! And you are so very lucky to not have to deal with that! Glad you were OK! I live in MS in the Hattiesburg area. We had the three rounds of bad weather here too. During the first round, we had an EF3 tornado that touched down about 4 miles from our house. There is so much devastation in our area. We are so blessed to have a house that was not in the path. Oh gosh, yes, we were watching the news about all of the devastation in your area. I'm so glad that you were not affected. I will keep your family and friends in my prayers. I am so glad you guys escaped without any damage! Tornadoes are so scary, do you guys normally get them in the winter like this!? I just cringe whenever I hear they are a possibility. So happy you are ok! When my oldest was a baby, we had a tornado touch down very close. We had to crouch under shelves in our basement. He was crying so hard, I had to nurse him the whole time to calm him. Scary stuff, I know. I hope this week is awesome for you!! Oh gosh, Andrea. I can't even imagine how awful that must have been. I have never experienced one actually touching down right by us before, and I'm so thankful for that. This one being about 5 miles away was probably the closest I've come to one, but that was just too close for comfort for me. I was wondering if you were having any of the storms. I am glad you are okay and out of harms way. The weather this winter has been insane! OH my goodness, Lindsay! What a weekend! So, so glad you guys are okay! I can't even begin to imagine how scared you were. We didn't get any rain, but we sure did get some horrible winds...horrible! It was cloudy and windy, definitely scary, but nothing like what y'all got. This post gives me heart palpitations! I can just sense the doom and worry in your words. So glad you guys are okay and that your house was untouched. I grew up in Alabama and totally understand the worry of tornados. Severe weather freaks me out too. Even more so since the big tornado that came through my Husband's hometown here in Alabama in 2011. Taught me to take them more seriously. Yikes! Glad y'all were safe and your kiddos are precious! That weather sounded so scary - so glad you guys are all safe! That shirt you guys made for Jacob's 100th day of school is so cool! And I love Olivia in bed with all her princesses - so adorable! Your artistic ability is amazing, Lindsay! That Elsa is perfect! I am so glad that you guys are ok. So scary. So glad to hear y'all are OK!! So scary! Olivia is way too cute sleeping with all of her dolls. Love that age! ahhhh and I'm over here complaining about rain! SO glad the scary storms didn't get crazy! Your kiddos are so dang cute by the way! That is so scary! I wouldn't have been able to sleep either! No fun at all. Go Falcons. I'll be rooting for them too since we used to live in Atlanta. Exciting time for the city, I'm sure! And, love that photo of Olivia with her princesses. I want them too! SO glad you guys are ok, this weather has been crazy but I heard you guys were getting hit a lot worse! That is so scary! I'm glad you guys were okay!! OMG this makes me feel freaking sick. You know my history with tornadoes, right? Yeah I don't do so well when the weather gets gross. I am so glad y'all were okay friend. Yikes! I wouldn't have been sleeping either. I can't imagine! OH my goodness! That is so scary, for me I would rather take an earthquake over tornados any day! At least they are fast and unexpected so there is no anticipation! Glad that everything turned out okay and that you were still able to get out and about a little this weekend. Yikes! We don't often have the fear of tornados here so I can't imagine how crazy that is...especially over night. Oh friend! I am sorry you had to deal with such a scary weekend. Weather freaks me out! The mention of the word Tornado gives me severe anxiety.